In his first visit to Benue State since he assumed office almost three years ago, President Muhammadu Buhari Monday called on Nigerians to refrain from escalating the deadly clashes between farmers and herdsmen in Benue and other states in the country, even as he appealed to Nigerians to continue to be accommodative and live together in peace. 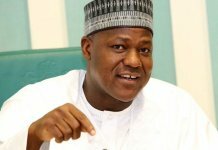 The president also said that he was unaware that the Inspector General of Police (IG), Mr. Ibrahim Idris, whom he mandated to relocate to Benue after the new year day killings of 73 people in Guma and Logo Local Government Areas of the state by suspected herdsmen, had only spent one day in Makurdi, the state capital. The president also hinted at a presidential run in 2019, saying he might return to Benue to campaign ahead on the elections next year. Buhari was on the third leg of his visit to condole with residents in states worst hit by the incessant clashes between farmers and herders of cattle. He had earlier visited Taraba and Plateau States and is slated to visit Rivers and Zamfara States next, both of which recorded high casualties when criminals struck in them recently. The president, who spent two hours in the state before flying back to Abuja to receive the U.S. Secretary of State, Rex Tillerson, made the call when he met with stakeholders in Makurdi. The stakeholders, who were led by Governor Samuel Ortom, comprised lawmakers and politicians, farmers and herdsmen, the clergy, academia, traditional rulers, and civil society organisations. The presidentâ€™s scheduled visit, notwithstanding, the killings continued unabated in Benue, as two policemen were reportedly killed in Tse-Oragbo, Nyiev Council of Guma Local Government Area of the state by suspected herdsmen in the early hours of Monday. Buhari, during his meeting with stakeholders in Benue, informed his audience that the relationship between farmers and herders of cattle will continue, adding that it behoves all to keep encouraging all parties to continue to live together peacefully. He said God had put farmers, herdsmen and Nigerians together, adding that collectively, all sides could leave peacefully by accommodating one another. 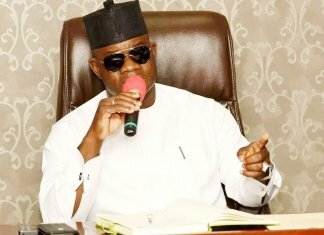 â€œGovernor Ortom has succeeded in passing the buck to me and I have heard all he has to say. I have made notes. But loyalty is a two-way traffic. â€œI was also visited by two senators and people from the state and I have come to visit the people. As leaders, we have to be loyal to people below you. What I did when I heard of the killings, I called the IG and gave him a directive to come to Benue. I did not know that he did not stay here for more than 24 hours. â€œI am however appealing to all to show more restraint. The relationship between farmers and herders will continue. It behoves on us to keep encouraging ourselves to continue to live together peacefully,â€ he said. He said he has friends from Benue State and there was no way he will deliberately overlook what was happening in the state and other parts of the country. The president pledged that the federal government would continue to address the issue of rural development and make sure that farmers are empowered. Buhari told the stakeholders that he was doing his best to tackle insecurity in the land. He denied insinuations that he had overlooked the killings in Benue, saying that he was genuinely worried about them. In his remarks, the state governor, while welcoming Buhari to the state, said Benue people were happy about the meeting and appealed to the president to upgrade the ongoing military exercise in the state tagged â€œAyem A Kpatemaâ€ to a full operation in order to effectively curb the attacks by herdsmen. â€œIf the exercise is upgraded to an operation, it will assist greatly in ending the incessant attacks and senseless killings by herdsmen,â€ he said. He observed that people had always believed in the president, which is why they voted for him in 2015. He recalled that on January 11, the state buried 73 people who were killed by suspected herdsmen, and since then 65 more people had been killed in Guma and Logo, and another 26 killed in Okpokwu, with over 5,000 displaced in the Mbatoho community. Ortom also called on the federal government to compensate the thousands of people who had been displaced by the clashes between farmers and herders in the state. Ortom, however, said no one was holding the president responsible for the killings, but stressed that those who had threatened to oppose the Open Grazing Law and were killing people in the state were going scot free. Accordingly, he reiterated his call for the arrest of the leadership of Miyetti Allah Kautal Hore, maintaining that it was responsible for the killings. Ortom also insisted that ranching was the best option for cattle breeding in the country and called on the federal government to take over the management of the Benue University Teaching Hospital, College of Education, Katsina-Ala and Benue Polytechnic, Ugbokolo. 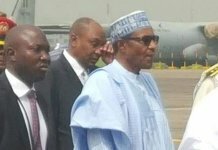 Like his principal, the stateâ€™s deputy governor, Benson Abouno, welcomed Buhari to the state, saying that its people were happy that he came to visit. â€œWe believe you are here because you have heard our cries. Your children have been in pain and today as a worthy father, you have heard our cries. â€œWe know your coming will not only grease but soothe the pains of the grieving Benue people. They know today that the chief sheriff of Nigeria is in town and this will send a very strong signal to the perpetrators of the killings. We know you are on the path to resolving the crisis once and for all,â€ he said. However, the chairman of the Benue chapter of Miyetti Allah Cattle Breeders Association of Nigeria (MACBAN), Ubbi Haruna, said his group was not responsible for the Benue killings, adding that the association was peace loving and the exact opposite of its public perception. â€œThe allegations are misleading. The association has always appreciated the peaceful and harmonious coexistence between farmers and herdsmen. â€œGoing forward, there will be peace in the state. Let bygones be bygones to allow peace and security to prevail,â€ he said. Haruna also called on all stakeholders to support the government to achieve peace. Also speaking, elder statesman and a former minister in the Second Republic, Chief Paul Unongo, told the president that the Benue people were deeply hurt and bewildered over the killings of unarmed villagers. He said Benue did not have a monopoly on the crisis, as states like Zamfara, Kaduna, Plateau and other parts of the North which voted massively for the president, had the same problem. He asked the president to degrade the herdsmen phenomenon, adding: â€œThe landmass of your country is not increasing, the population is. So, if you donâ€™t do something now, you will discover that you will end up having a country ridden by terrorism far beyond your dreams. Unongo, however, cautioned that Tiv people should not be made to give up their farmlands for herders of cattle, saying they are entitled to their livelihoods and peaceful existence as farmers. He also informed Buhari that the state governor had been misunderstood by the presidentâ€™s security chiefs and was under threat due to his stance on the Benue killings. â€œHow can somebody with Fulani blood be the leader of the Tiv people. Your son, Ortom, is misunderstood by some of your security aides, especially the Police IG. He is under threat,â€ he said. The presidentâ€™s visit was low-key and was largely ignored by residents of the state who went about their normal businesses, amidst very tight security. A statement later Monday by the presidentâ€™s media aide, Femi Adesina, said when Buhari responded to the â€œshopping listâ€ of the stakeholders, he informed them that he would not make any promises during his visit Monday and asked them to pray that the economy improves, but said that he may do so if and when he returns to the state for the 2019 election campaigns. â€œWhen coming back on campaign, if coming back on campaign, I may promise,â€ his spokesman quoted him as saying. Buhari was quoted as adding that his administration would continue to empower farmers with loans by the Central Bank of Nigeria (CBN), noting that the agricultural policy of his administration had led to a 90 per cent reduction in rice importation. However, just before Buhari arrived the state, two police officers were reported killed in Tse-Oragbo, Nyiev Council of Guma LGA. An eyewitness in the area, who spoke with reporters in Makurdi, said that suspected herdsmen carried out the senseless attack a few minutes before Buhari arrived the state. 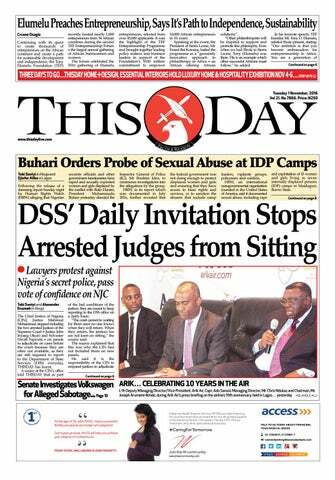 All attempts by THISDAY to confirm the story proved abortive, as calls to the police authorities did not go through. Meanwhile, the Peoples Democratic Party (PDP) Monday, in reaction to the presidentâ€™s visit to Benue months after the massacre of several residents, described the visit as an afterthought, saying it was needless and only served as a large billboard of his administrationâ€™s gross insensitivity to the plight of Nigerians. The party also said its mega rally, which was held in Dutse, the Jigawa State capital, on Monday, had opened a new vista for the party as the â€œtrue hopeâ€ for Nigerians. Stating that Buhariâ€™s visits to the troubled states, particularly Benue, was evidently orchestrated for political reasons, the PDP, in a statement by its National Publicity Secretary, Kola Ologbondiyan, said it was appalling and highly disheartening that the president only visited his distressed citizens after the widespread outcry over his aloofness. â€œWhat is the purpose of a condolence visit when it does not come from the heart, but was orchestrated to deceive and beguile the people ahead of the 2019 general election? â€œIndeed, we agree no less with Nigerians that this cosmetic and politically motivated visit is nothing but a direct mockery of the dead and a heavy slap on the faces of the bereaved. â€œThis is the same president, who in the wake of the massacre, summoned the leaders and the bereaved to Abuja, rather than complying with the age-long tradition of Africans by immediately visiting the bereaved,â€ the PDP said. The major opposition party added that months after the tears of the affected people had dried and they were painfully gathering their broken pieces, Buhari was now trying to use them for political posturing by staging a â€œcosmetic condolence visitâ€ just to score political points. 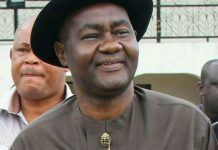 The party said it was more disheartening that after the public criticism that trailed the â€œpresidentâ€™s glaring aloofness and failure to visit the direct victims during his whistle stops in Taraba and Plateau States, his handlers have now arranged a put-on visit to some internally displaced personsâ€™ camps in Benue, which is nothing but a posturing stunt to further deceive the peopleâ€. The president, however, cancelled his visit to the IDP camps and to the military commanders in Benue. â€œIf the Buhari-led administration is genuinely concerned about the well-being of the people of Benue and other troubled states, what decisive step has been taken to apprehend those behind the carnage and bring them to book? â€œWhat steps have been taken to ensure adequate protection for the people and to end the daily bloodletting in the land? â€œInstead the government has been engaged in making reproachful comments and dishing out false information to the people,â€ the party added. The PDP charged the presidency to end the unnecessary roadshows and take decisive steps to ensure the security of the people, saying those organising the roadshows must understand that Nigerians can no longer be deceived by the cosmetic and pretentious posturing from the â€œgrossly insensitive and incompetentâ€ administration, which has brought them so much pain.